My wife too (and yes, that is my daughter having a small lollipop - we're not nutritional ogres and there was a cookie jar full of them at the hair salon). You know I've known my wife for 8 wonderful years and during that time we've had 3 houses, 5 jobs, 2 beautiful children, and in my wife's case - 4 haircuts. Because for as long as I've known her my wife has been growing her hair long enough to donate to "Locks of Love", a charity that uses donated hair to make wigs for children who for various reasons (including chemo) don't have any. This year my ridiculously kind-hearted, 4 year old daughter (clearly she takes after her mother), decided that she wanted to donate her hair too and sure enough yesterday both of them had 10 inches removed. 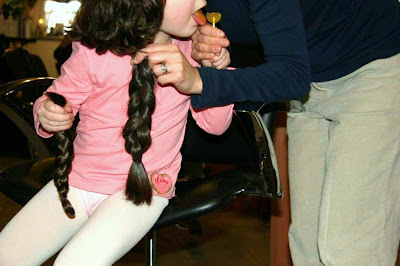 If you've got hair to donate and you live in Ottawa this year's "Mitzvah Day" (translates from Hebrew to Good Deeds Day) which takes place this Sunday is including a Locks of Love station. If you've got 10 spare inches of hair, professional stylists are donating their time to cut the ponytails and style your hair for free. Despite its location at the Soloway Jewish Community Centre and its Hebrew name, Mitzvah Day is a non-denominational event with monetary proceeds this year going to Ottawa's Snowsuit Fund. It's a great event, a great cause and if you want to come there are many activities for all ages including making hygiene kits for parents of patients at the Children's Hospital of Eastern Ontario, birthday celebration kits for children in shelters, cheer kits for seniors and welcome kits for new immigrants. There will also be entertainment for the kids in the form of Dr. Kaboom! If you're there feel free to come and say hi!